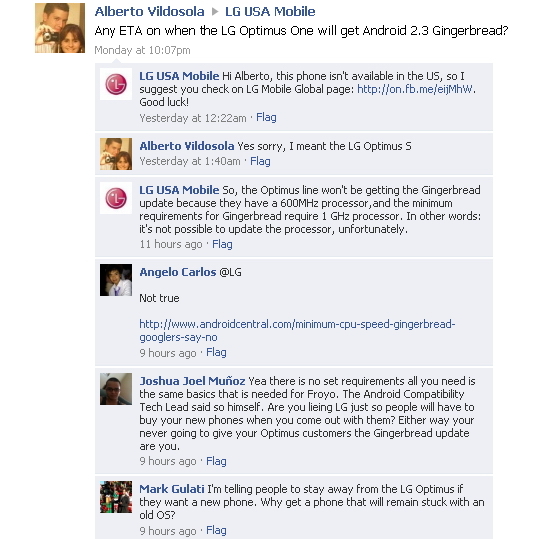 As you can see in the above, LG's Mobile USA's Facebook site had announced that the LG Optimus One, which sold over 1 million units, will not get the Android 2.3 Gingerbread OS update. In other words, the LG Optimus One as well as the other Optimus handsets, looks like it's staying the with Android 2.2. And if there's any question regarding the minimum processor requirement to carry the Gingerbread to be 1GHz, that was reported to be untrue by Romain Guy, an Android engineer, that said there is no minimum requirement for Gingerbread.